Following a Te Papa Art After Dark session on the little details that matter (hats, shoes, jewellery, fabric and a well dressed man), I am on the couch awaiting my Thursday night telly treat – Project Runway. This week the battling designers are being asked to ‘join forces with art students to create artwork that will lend inspiration to garments’. In keeping with the spirit of Project Runway’s theme, this week’s Wedding Dress is the result of a designer’s collaboration with an art student. Rather than a dress it is a coat, but what a coat! ‘Rajputana’ Wool Coat by Bellville Sassoon, London, 1970. V&A: T.26-2006. 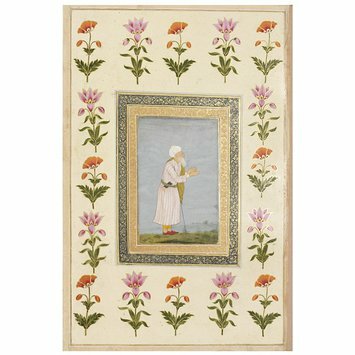 Given by David Sassoon. Entitled ‘Rajputana’, it is from Bellville Sassoon’s Indian-inspired Winter collection of 1970/71, and was featured in the November issue of British Vogue. 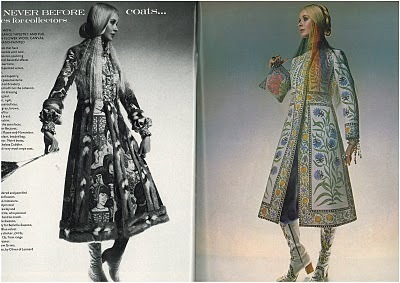 ‘Rajputana’ coat as featured in the pages of British Vogue, November 1970. Modelled by Maudie James, photographed by Barry Lategan. The coat was designed by Richard Cawley (b. 1947), an assistant designer at Bellville Sassoon, a London fashion house founded by Belinda Bellville and David Sassoon in 1953. Cawley collaborated with Andrew Whittle, a student at the Royal College of Art Illustration School, on the design of the floral pattern and border. They found inspiration in the V&A’s collection of Indian artefacts. Andrew Whittle meticulously hand-painted the pattern onto the wool crepe coat once it was constructed. If you are able to attend Unveiled, make sure you take a good close look at the paint work, especially around the seams – it is so skillfully done. From a distance it can easily be mistaken for embroidery. 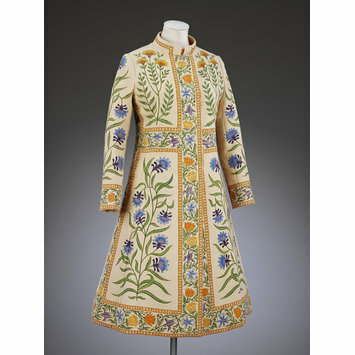 Following the success of this coat – it was one of the collection’s most popular designs – Whittle and Cawley went on to collaborate on more hand-painted garments. The coat was worn by Sara Donaldson-Hudson on her wedding day. Sara’s fashion conscious mother, Dorothy, had spotted the coat in Vogue, and convinced her daughter that it was a fashionable and appropriate choice for her upcoming registry office wedding. Dorothy, a mother with firm views, had declared that her daughter was not to wear white on the grounds that her fiance Nicholas Haydon was a divorcee. Sara wore the coat with an orange shift dress and matching satin boots from Chelsea Clobber (note the Vogue model is wearing boots painted with the same pattern as the coat). As mother-of-the-bride, Dorothy wore an orange jacket and dress ensemble that coordinated perfectly with her daughter’s outfit. Striking a pose, she beams with absolute pride from the wedding photos. Wedding Dress of the Week is posted in conjunction with the exhibition Unveiled: 200 Years of Wedding Fashion from the Victoria and Albert Museum, London which is on display at Te Papa until 22 April. I have heard about the exhibition and have been following it on facebook – but today I took some time out to read your posts on here…they are awesome and very inspiring. I hope you are able to keep a record of your posts – they are very informative. I finally saw the exhibition yesterday, awesome, loved the coat. the gowns were beautiful… thank you for Te Papa in having this exhibition to view history.